They are used to them. Talked to Jacquizz about the camera. He said he just has to watch his mouth, but he's used to them being around. Any of the players complaining about the cameras? Have you seen em react differently because of em? I find it hard to believe they're not a distraction. I have to check it with my man Nick Nelson, the biggest Saints fans living in the ATL. I don't know. Are aints fan concerned at all with Brees having an injury? Would he be starting week 1 if that injury doesn't improve? Yes. Hawley has to play better than McClure did. That will be tough. Asamoah and Matthews should be upgrades. Baker had a strong '12. He just needs to stay healthy. Do you think the O-Line is going to be better then it was in 2012? They are expecting it to be tough to move the ball against the Texans stout defense. If they can get some protection, they can attack that secondary. Is Coach Smith and Coach Koetter taking towards the conservative side this week against Clowney and Watt for Ryan in the game this weekend? I expect one series. They'll try to throw him two passes. One will be a slant. Second one a bomb. How much do you expect Julio to play with his one-day one-day off deal? CB Robert Alford is coming along nicely. What player has made the biggest improvement since last season? The cheerleaders earned an A last week. What rookie not named Matthews has made the biggest impression so far? That was an F. They need to tackle and not blow coverages. Bartu missed a big tackle and there were two major missed assignments in the pass defense. If you answered already, I apologize. What kinda grade would you give our defense in the game last Friday? Any adjustments been made against Houston this week? It's been a good week in Houston. The defense got a lot of good work in, even though I concentrated on the offensive line. Every team has holes. Thank Pete Rozelle for this notion of parity. The ERA of dominate roster building is over. I still see serious holes in this team. I am trying to be optimistic but I just don't see the changes we need to compete for a SB. Thanks D Led! Keep up the good work sir. We'll have to ask Coach Smith that again. 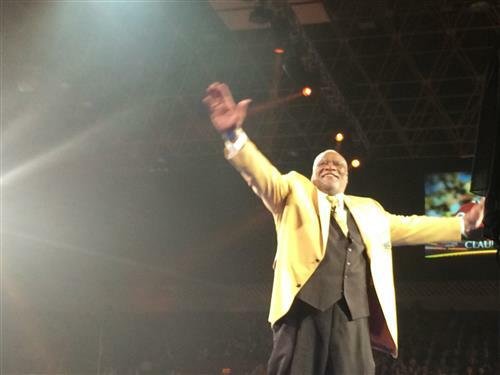 Claude Humphrey after getting his Gold Jacket in Canton. All right. I'm out. This was fun this week. See ya'll next week. One more. Matt probably was. That was whack.The QB gets whatever he wants. He got there first. Thanks for stopping by. This was fun. You've clearly missed out "Sacks aren't important" discussions with Coach Smith. Up until this point, don't you think it's ironic that this coaching staff hasn't produce a genuine past rusher? He may be able to salvage his career. What's up with Peter Konz? Talk about a bust! Smittyball wins. He's the winningest coach in franchise history. Last year was an anomaly. Do you Mike Smith has learned that "Smittyball" doesn't work that we need to play more like the Patriots and ugh Saints and run up the score? What to see the defense in action tonight and vs. Texans next week. From what you've seen so far, what are our odds of spanking the AINTS? Yes! Although, I did just have my annual medical exam and she said something about red meat. Can't really remember right now. Is there gonna be an East Texas BBQ tour next week? He had to be, but he was bigger than that moment. Will the Falcons be bringing in another LB to fill Spruill's spot in camp, or will they just go with what they have at this point? OK....One of my concerns about Hrd Knocks.....Hawley getting unhinged because a rookie got in his face.....Seems to me he shuld not be concerned about that....How is Hawley looking now after that?